Gena Rowlands plays a philosophy professor who overhears a therapy session in the next-door office via an air vent. The chance observation causes her to reflect upon lies and deceptions in her own life. Gina Rowlands moves this Woody Allen drama. Another Woman, like Allen's other early dramas, remains quite underrated. Actually this movie arguably broke through the intense plasticness of his earlier September and Interiors. 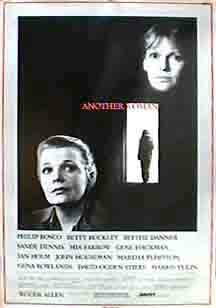 Gena Rowlands' performance as a philosophy professor overhears through the air vents the painful sessions of a psychiatrist next door keeps steals the show with a quiet intensity that envelops the rest of the ensenble cast, that also includeas Gene Hackman and Ian Holm, who plays her husband. Allen had, like his protagonist, recently turned 50, and the sense of personal stocktaking here is much more compelling--and much less self-indulgent--than in a lot of his other films. Surely the magisterial presence of Rowlands made a big difference. Sandy Dennis makes an appearance as an old acress friend who dispises her, and John Houseman as her widower father. Like Lloyd Nolan's in Hannah and Her Sisters and Keye Luke's in Alice, Houseman's turned out to be a valedictory performance. We cherish it--along with the inspired casting of David Ogden Stiers as, in effect, the younger John Houseman.